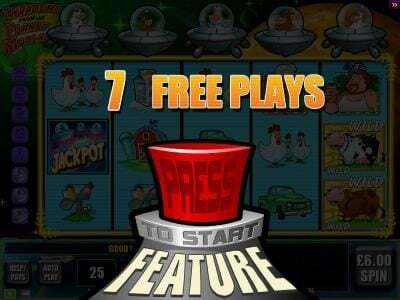 Invaders from the Planet Moolah online slot machine pictures and slot feature list from WMS, play Invaders from the Planet Moolah Slots for free. Invaders from the Planet Moolah Slots 5 out of 5 based on 1 ratings. 1 user reviews. 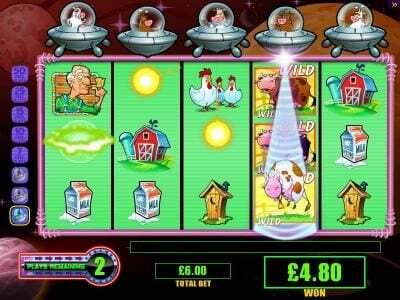 Invaders from the Planet Moolah, a wms game that comes with 25 paylines on its 5 reels, offers you prizes as much as $3,750. This Slot has Free Spins and wilds as features. Looking for a funny game which will make your day and keep you busy for hours? 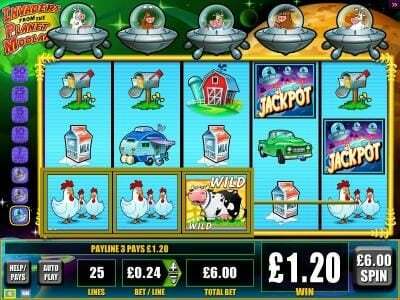 This slot might just be the thing for you, since cows from outer space are invaders that come in flying saucers and they seem to be invading a farm in this case. The game is as funny as the idea that is used. Most of the images that you will find as symbols are taken directly from the life on a farm, but the area from the background gives us images of outer space and the five flying saucers with cows as pilots. 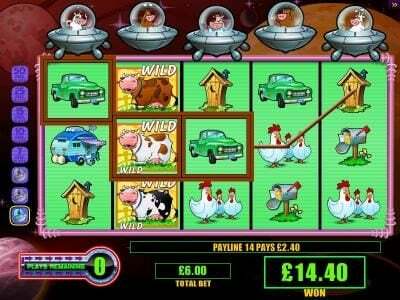 The symbols of the game include three wild cow symbols, a Jackpot symbol with the flying saucers, a dog, the farmer, the farmer’s wife, the cowboy girl, the redneck, a red barn, a trailer, a truck, chickens, a milk carton, a mailbox and an outhouse. 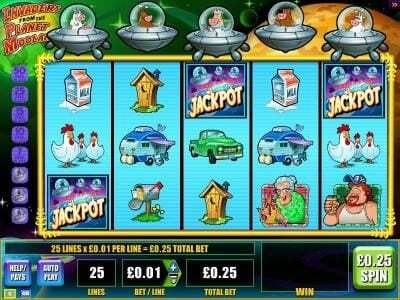 The betting options of this slot are easy to figure out, since there are only 25 lines and they get one coin each when the bets are made. Furthermore, the lines are all selected, so you always bet 25 coins. The only difference is when it comes to the coin denomination that is going to be used, which will start at $0.01 and go up to $5. 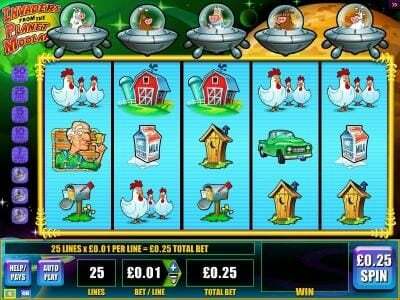 The player bets up to $125 in this game and that will result in prizes of up to 750 coins, or $3,750. The three wild symbols offered by the game give us three cows, each one looking a bit different. These wild symbols can appear on the reels 2 to 5. They can substitute for all other symbols from the game, and interestingly enough there are no exceptions to that rule. 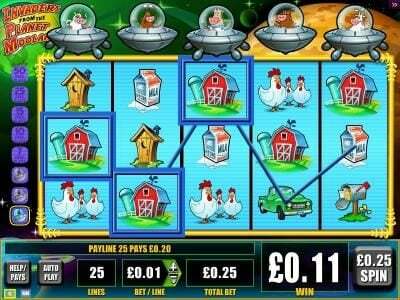 The top prize of the game is awarded through the symbol marked Jackpot, the one with multiple flying saucers invading. The cascading reels feature is found in many other games and it’s an option which will increase the frequency of wins for the player. As paying combinations fall off the screen, new symbols come and take their place. If you get multiple cascading reels, you can get access to free spins. The player gets 7 free games for 4 consecutive cascades and the number keeps going up, with the 50 free games being given for 8 cascades. It’s one of those games that should be given a chance by everyone. It’s funny, it has some decent features and you will love it.